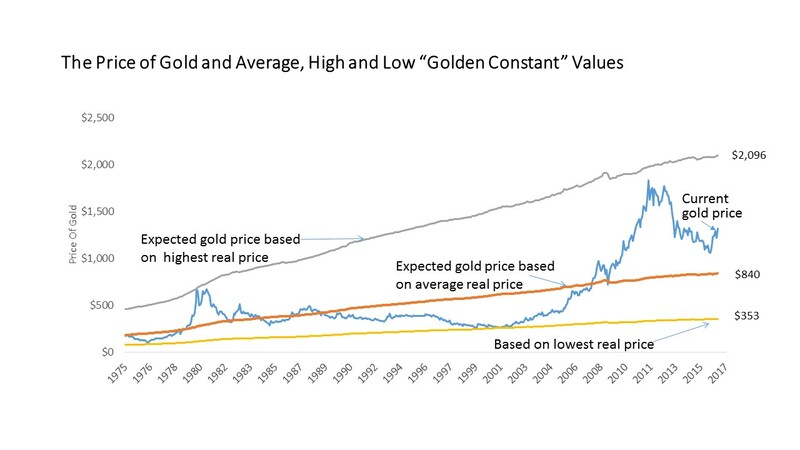 In The Golden Dilemma, Erb and Harvey (2012) explored the possible relation between the real, inflation adjusted, price of gold and future real gold returns. This update suggests that the real return of gold over the next 10 years could be about -4% per year if the real price of gold mean reverts or -12% per year if the real price of gold overshoots and declines to previous low real price levels. This view reflects a “golden constant” hypothesis that inflation is the fundamental driver of the price of gold. Of course it is possible to entertain other hypotheses. A “golden constant” perspective suggests a fair value price for gold of $840 an ounce and a possible overshoot price of $353 an ounce. An Impressionistic View of the 'Real' Price of Gold Around the World.